(Another day, another delay. But not to fear, there's more where yesterday's Manhattan came from: here's a passage on Annie Hall from that same essay. Hopefully tomorrow, or the day after, I'll discuss a film mentioned by characters in both movies. 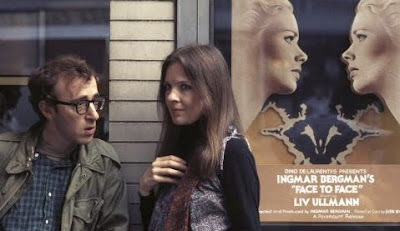 Annie Hall is introduced through a monologue by the main character, Alvy Singer, played (of course) by Woody Allen. He tells the joke about the old women in the lousy restaurant and then bemoans the fact that he and his girlfriend Annie Hall broke up; it’s something he just can’t get his mind around. The rest of the movie is flashback; after they meet at a sports club Annie invites Alvy up to his rooftop where they exchange pretentious banalities, hilariously subtitled to show what they’re really thinking as they speak. Somehow they hit it off, with the neurotic, Jewish Alvy trying to shape the nervous, daffy WASP Annie. Whenever she’s in over her head, she simply recites, “La-di-da. La-di-da. La la…” Its her way of resigning herself to fate and forces out of her control, going with the flow. But Alvy won’t accept this passivity; he gets her to see a shrink, tries to convince her not to rely on drugs for refuge, and encourages her further education and singing career. In the end she leaves him, but as a result of their relationship she is more confident and independent than before. Along the way there’s animation, characters addressing one another across time and space, characters addressing the audience, fantasy sequences galore, split screen, indeed every device one could imagine. But the effect is not surreal because we know Alvy is a comedian and he’s telling the story as he knows how; there is no doubt that he (and by extension Allen, who bears more than a passing resemblance to Alvy) is the storyteller here. At least Alvy doesn’t cop out with us the way he does with his first play, which echoes a fateful meeting between Annie and Alvy in California, but ends the scene with the two reuniting. “What can I say; it was my first play,” Alvy shrugs to the audience. Critics and audiences needed the eggs as well, and Allen was soon churning them out. But each film was decorated in a new Easter coating so that one could never be sure just what form his meditations on love, art, and death would take next. For four years from 1977 to 1980, Allen came out with a new film that expanded his boundaries and showed what a deep and truly talented artist he was. These four films, Annie Hall in 1977, Interiors in 1978, Manhattan in 1979, and Stardust Memories in 1980 form the high point of his career. And Allen followed his Academy Award for Annie Hall with an enigmatic, ultra-serious motion picture in which he didn’t even appear as an actor.